Taste test: These potato chips were thick cut and very crisp, with a ton of very tasty spices on the chips. So they had a good crunch and a great taste. 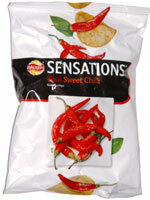 Kudos to Walkers for the ambitious flavors of the Sensations line, but please give these wider distribition on our side of the ocean. These were a very popular around the chip bowl. Smell test: Very mild but nice smell, with chili, tomato, garlic and more. This snack was discovered by Judy and Lee in Bermuda. Review published .